It's generally agreed that the humble automobile is going to change more in the next twenty years than it has in the 107 years since the first Model T rolled off Henry Ford's production line, the only uncertainty being the pace of that change. It's likely there will be two phases of evolution: in the near future we'll see the bolting on of ever-more-sophisticated automation and nosy sensors, from self-parking to stop/start traffic jam autopilots to hands-off motorway cruising and finally, full automation. 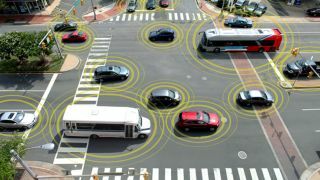 Phase two will likely see car ownership beginning to be phased out – instead you'll whip out your smartphone and hail a smart car for a particular trip. You'll be ushered to your destination at briskly efficient speeds made possible by the stage direction of some hive mind on a server somewhere, controlling a vast network of vehicles. A peek into our near future throws up a miscellany of smart delights that we can look forward to in our Blade Runner-esque Volkswagen, Ford or GM car – if those companies haven't been class-actioned and fined out of existence following another wave of emissions shenanigans. Cars have packed heads-up displays for years, with GM the first to implement this feature back in 1988, in its Oldsmobile Cutlass Supreme saloon. But genuine, full-fat augmented reality displays are coming. Alongside the obvious speed readout and satnav directions, the screen will integrate information from the car's sensors, highlighting potential hazards such as cyclists, pedestrians stepping into to road, and even nearby animals with visual and audible alerts. You want night vision? Infrared cameras will scan the road ahead and enhance the view you see through the windscreen to pick out road signs and hazards, enabling you to speed through the dark with bat-like assuredness. Essentially, this means your car will be spying on you, to make sure you're in a fit state to drive. Your heartbeat can be measured via the steering wheel or your seatbelt, alongside your breathing rate, and an in-dash camera will track your blink rate and glance frequency. If your car decides that you're showing signs of tiredness it'll flash a warning message onto the windscreen, or even navigate to a rest stop and shut the car down if it decides you're too tired to continue. BMW and Mercedes have already created sensors that learn your driving style and can sense, purely by your inputs, when you're too tired to drive. Yes, your car will become your mum. Concept car makers are big fans of this, with VW especially going large on it in their concept cars. The idea is that internal sensors track your hands for split seconds when they're off the wheel, and translate your gestures into inputs. So if you want to turn the radio up you take your hand from the wheel, mime a radio dial being turned –and hey presto! Maximum Bieber. This could also work for changing radio stations and selecting CD tracks, and adjusting the air con. We're not talking about mere satnav traffic reports here – when your car is part of an internet network there are all sorts of smart ways it can help you. For example it can calculate the amount of fuel you have left in the tank, work out if it's enough for you to reach your destination, and, if not, scan ahead to find the fuel stop with the best prices on your route and direct you to it.